GE is another excellent example of a multinational company in Vietnam that has adopted a proactive approach to improving the quality of higher education in fields relevant to its business(es). This high-tech center, housed at the University of Technical Education (UTE) in HCMC, will give 100 students a day the opportunity to train on state-of-the-art electrical distribution and control equipment. 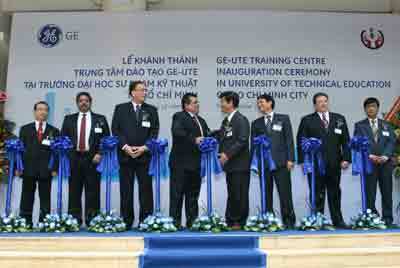 GE was one of the first US companies to come to Vietnam when it opened a representative office in 1993 in Hanoi and in 2001 in HCMC. Its diverse businesses include aircraft engines and power generation to financial services, health care solutions, and television programming in over 100 countries and territories. Its clients include Electricity of Vietnam (EVN), Petro Vietnam, Vietnam Airlines, Vietnam Railway Corp., as well as state-owned and private hospitals. Earlier this year, a $60 million factory was opened in Haiphong to manufacture wind turbines for local use and export. GE also intends to focus on health care and other areas in the years to come.